THINGS happen in pie shops, as politicians have learned to their cost. It was in just such a humble location that Reg Goves knew he’d landed in a country different to his birthplace. Fresh off a flight from his native India, he set out from his uncle’s place to find food for his wife and three young children. He wandered down to the local shop and was greeted in a disarming Australian fashion. “The lady behind the counter sung out ‘what can I do for you, love?’ and I must have blushed a little,” Reg laughed. “For me, love is something a lot more personal, so I was originally quite shocked, but later very impressed. “And back home it was only used as a term of endearment among people who knew each other really well. So it took some getting used to. “I didn’t know how to order even simple food but I told them what I wanted and they were very kind and extremely good in helping me. 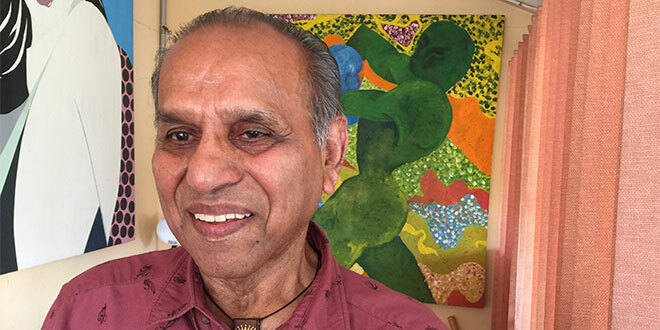 Born in India in 1937, Reg is indicative of the changing make-up of the local church – originally from Asia but now proudly Australian. His parents and grandparents were originally from Goa, the former Portuguese colony on the west coast of India. The Catholic colony was a paradise in many ways, but the population struggled to find work outside of fishing and farming and needed to migrate into India to support their families. Reg’s father, an engineer, was amongst those to relocate to Asansol, in Bengal state. He ensured his son’s schooling was with the Christian Brothers, however, for which Reg is still grateful. “I was educated in English, which was a must with the brothers, but the Indian Government insisted we learn two other languages as well. “One was the language of state, Bengali, and the other Hindi, which was more or less the accepted language in India. “So you became polyglot after a while. Of course the concept of India itself is foreign to Reg, a moniker put on the country by past rulers. Unfortunately for Reg, the late 1960’s saw his homeland turning out to be not so maternal. A trade-union member, he fell afoul of management and senior union officials by successfully arguing for workplace concessions. Although the battle was won, he was warned any future advancement in the workforce was now blocked. Hence he, wife Ann, also from Goa, and their three young children, Lloyd, Cajetan and Adrian, all boarded a plane for Perth in 1973. Some fellow family members had migrated to Australia after 1966, when Portugal ceded Goa back to India, and encouraged the move. Within a week of arriving in Brisbane Reg had secured a job with an engineering firm that he would remain with for 30 years. Much like the pie shop, he was impressed by the openness and egalitarianism of the workplace. “I went for interview, and I still remember the gent – Bill Shepherd, he was the personnel officer,” he said. “I introduced myself and the first thing he asked was ‘are you a unionist?’ and I said I had been all my life. “I’m wondering what’s going on, and then this other man happens along and Bill says ‘look, I’ve recruited a new member for you’. Another eye-opener were the forms of address being so different to the caste system of India. “I’ll carry this to my grave but on the first day I started, I had my overalls on and Bill Shepherd walked through the workshop,” he said. “I was having a bit of trouble and he came over and said ‘how are you going, Reg?’ and I replied ‘pretty good, sir’, stopping him dead in his tracks. “I told him again ‘pretty good sir’ and he said ‘Look Reg, you’re not in India. This is Australia. You address me as Bill and I address you as Reg’. “He again circled back and said quietly but nicely ‘Reg, you work for the company, I work for the company. Over here it doesn’t matter what you do; if you’re sweeping the floor or writing the cheques, everyone is addressed by their first names’. Reg and Ann soon purchased a home at Bowen Hills, settled their boys into St Columban’s College at nearby Albion and resumed their life in the Church. Over the years they have moved between parishes but are now happily settled at St Agatha’s, Clayfield, where Reg does collections and Ann is a lector. With regards to the upcoming Plenary Council 2020, in which everyone can have their say on future direction of the church, he is cautious but hopeful. “I think the church is good as it is, but there has to be progress too,” he said. “Of course, we can tend to modernise things too much and allow other concepts to creep into the system that retard it to some extent. On the evolution of priests ministering in this country he also sees both sides of the issue. In Clayfield parish there have been two order priests serve consecutively – Fr Saji George (now at Burleigh Heads Parish) and the current associate pastor Fr Prema Kumar Rethnamony. “It makes me feel good to see missionary priests come out from India but it also makes me sad to some extent because my view is the priests are vacating undeveloped nations with a lot of poverty,” Reg said. “Here in Australia; if you’re willing to work hard and get involved it’s a good life, but the flipside is because it’s such a good life, not a lot of people are getting involved with the church. “As a result of that detachment, it’s probably why a lot of these missionaries are coming here. Reg looks back with contentment on the family decision to come to a new land. “It’s a wonderful country. I’ve never ever regretted coming here,” he said. “People talk about racism and discrimination, but that experience has never happened to us. “My children never had one problem, they were well liked and the head of their sports teams; my wife also worked without incident at the public hospital.